Barry Peckham’s preferred working method is to be out in the landscape working directly from the subject . The ever changing light provides constant stimulation which helps to produce exciting effects. For larger works he spends studio time on the drawing and composition before taking the canvas out of doors to work on. 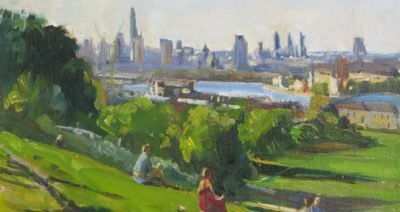 Barry has used a variety of mediums in the past including Oils , Watercolour and Pastels. For most of his work barry now uses Oils with Watercolours being used less often. He uses flat hog hair brushes and some nylon pointed brushes when painting in oils starting with paint diluted with White Spirit then as the painting progresses thicker paint is applied. He generally has more than one painting on the go because he works on location which is subject to changing weather, light and seasonal conditions. Photographs are sometimes taken as backup for details or lack of time. Commissioned work presents different requirements and often takes much longer to complete. Mainly self taught, part time study at Southampton Art College i.e. A level art, Life Drawing, Etching. 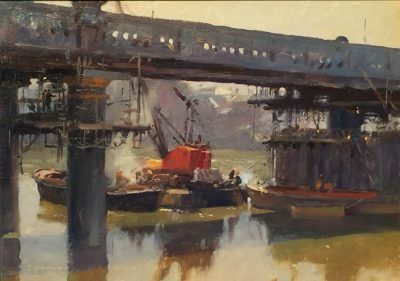 Exhibited with Royal Society of Marine Artists, Pastel Society, Royal west of England Academy, Royal Academy. Elected full member of ROI in 2000.